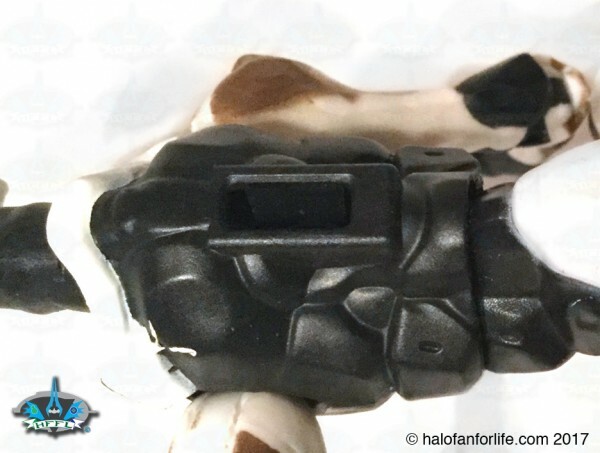 Cost: As this figure is made up from parts of each of the series 1 Mattel Halo figures, to get it, you either have to buy one of each figure OR you can try your luck at buying pieces through sites such as eBay. 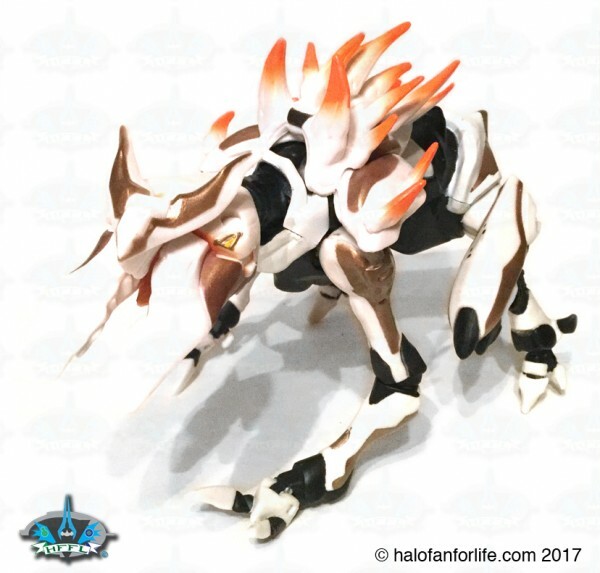 If you buy the set of figures the total cost of them is $90 for 6 figures. 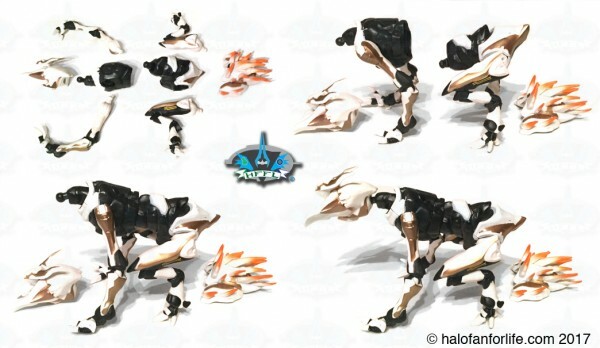 Each figure has one or two pieces of the Crawler, depending on which figure it is. So to nail down an actual cost to this specific figure is a little bit different. I will say it’s worth is about $15. However, the complexity by which you have to obtain the individual pieces makes this more valuable. So I put that amount at around $40. FIrst up, you have to have all the parts. Here I’ve laid them out to show them in reference as to how they are assembled (top left). Subsequent steps at assemble show how the Crawler comes together. It’s not difficult to attach parts. However, be sure to get them put on correctly. I at first mistakingly put the rear legs on backwards…. 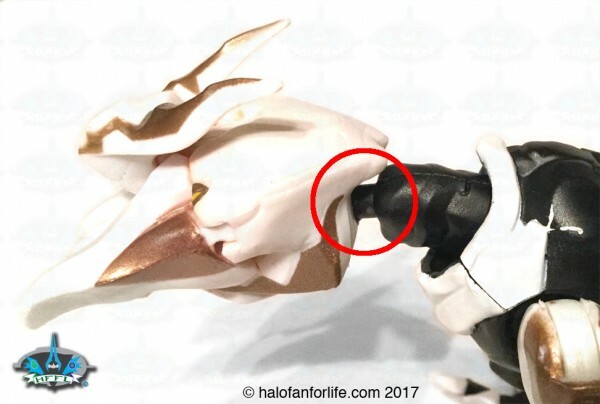 There is a slot on the top of the front part of the body for the Crawler’s back piece. I did have one little bit of difficulty. That of the head to neck assembly. At first, the peg on the neck didn’t want to fully go into the hole in the neck. After a few attempts, I stopped and finished building the rest of the crawler before I went back to it. A little bit of elbow grease later and bam, it finally popped into place. I wanted to highlight this so you can see for yourself that indeed it does go in all the way. The crawler’s mouth opens wide! Here I wanted to show the comparison of size against two of the other figures in the series. It’s actually pretty big! Articulation: There is a good amount of articulation here. I do wish the ‘hocks’ of the legs had articualtion as well. As such, you can really get the crawler into a fully stretched out pose. 8 of 10 medals. Paint Application: The paint application is good. 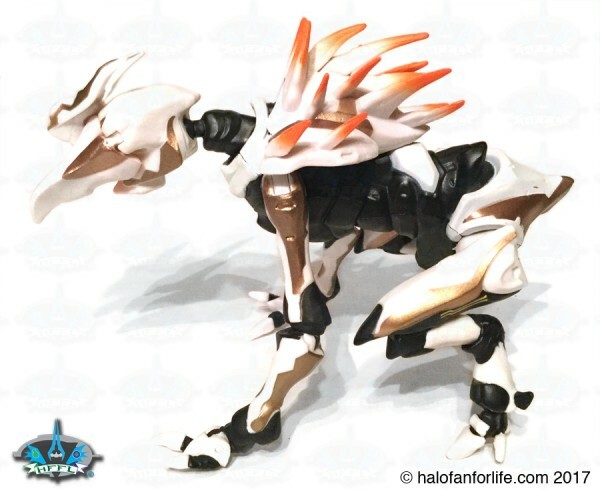 I was concerned about the white color of the crawler until I realized that this is the Halo 5 Alpha Crawler and not the silver Alpha Crawler of Halo 4. 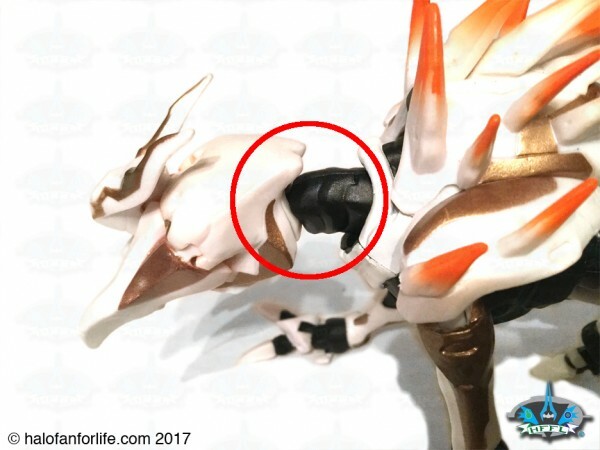 I had originally wrote s part of the review with that in mind and gave it a mistakingly poor grade on paint due to the misunderstanding, I’ve retracted that now and this part of the review now reflects the correction with regards to silve vs White Alpha Crawlers. 9 out of 10 medals. Playability: There is certainly plenty of play/display potential here. A good amount of articulation can get the crawler into a decent amount of posed. 8 of 10 medals. Do I recommend this product? YES. 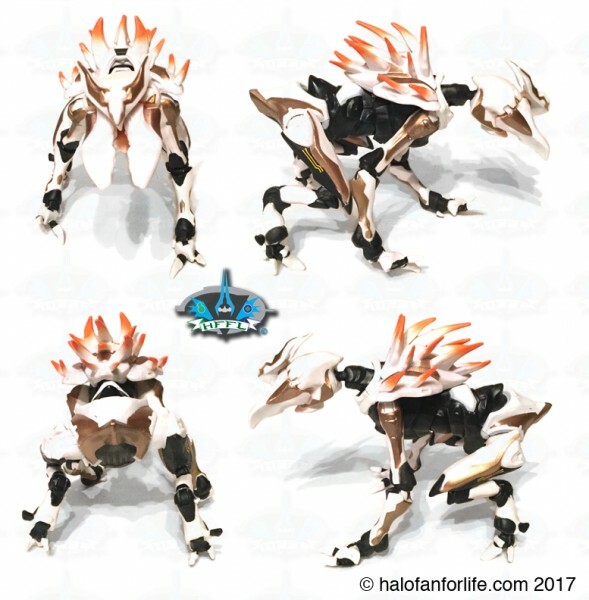 While I much prefer the silver Halo 4 version of Crawlers, this Crawler accurately portrays that of Halo 5 Alpha Crawlers. The articulation is good. 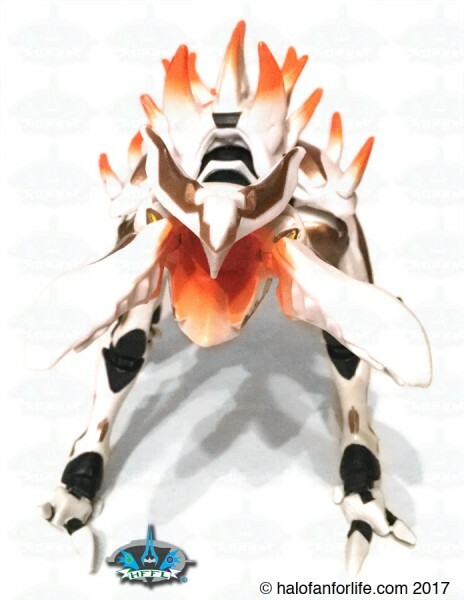 Honestly though, I’d rather have crawlers come out in the main line than be build-a-figures. 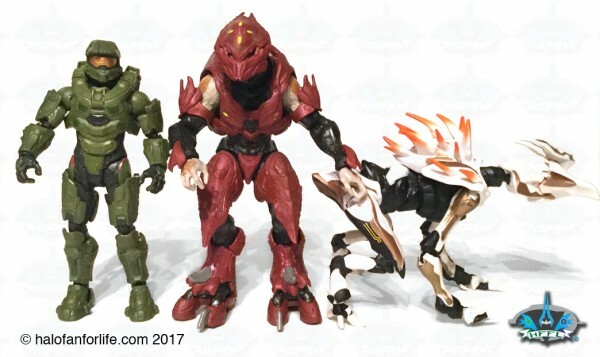 I’d prefer something really HUGE like a Hunter or Atriox to be the build-a-figure. But that’s my opinion. so we’ll see where this line goes from here.